Posted on Tue, Aug 21, 2012 : 11:55 a.m.
U.S. Secretary of Transportation Ray LaHood speaks as Michigan Gov. Rick Snyder looks on at the launch of a vehicle-to-vehicle communication project in Ann Arbor Tuesday. 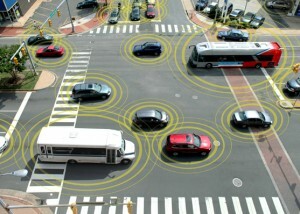 The reinvention of the automobile: U.S. Transportation Secretary Ray LaHood said that's what's happening in Ann Arbor with the launch of the Department of Transportation's vehicle-to-vehicle communication experiment Tuesday. The joint project with the University of Michigan, launched with 2,800 vehicles, is part of a $25 million federal effort to increase roadway safety. Gov. 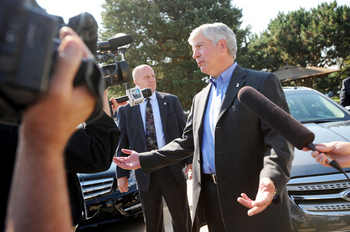 Snyder speaks with television reports at the launch of the vehicle-to-vehicle communication project Tuesday. U-M's Transportation Research Institute recruited 2,800 residents and drivers for local companies to create one of the largest smart car deployments ever conducted. Wireless communication devices are installed in volunteer vehicles and dozens of local roadside and intersection locations. The vehicle devices can audibly and visually alert drivers when safety threats approach. 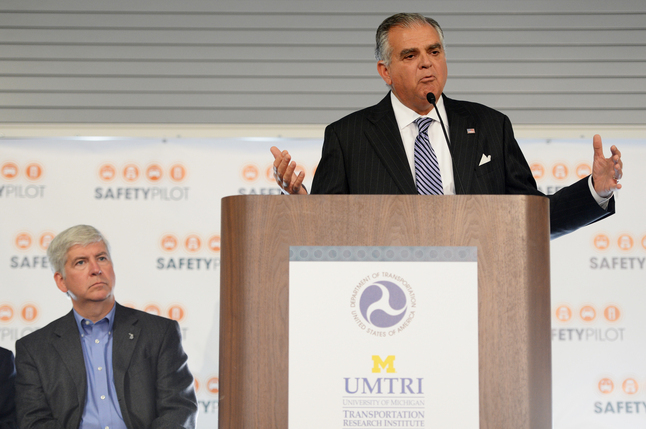 "This is an experience that cannot be duplicated in any lab," said U.S. Secretary for Transportation Ray LaHood. "We're taking a major step forward in understanding cutting-edge technology tools that offer a real promise of making our roads safer. Vehicles talking to vehicles: Who would have ever thunk it?" he added. LaHood compared vehicle-to-vehicle innovation to the development of the seatbelt and the airbag. But unlike the seatbelt and airbag, wireless technology has the ability to not only increase vehicle safety, but decrease traffic. The technology can communicate with wireless devices embedded in intersections and on roadways and warn drivers about traffic and suggest alternate routes. "Wouldn’t it be kind of fun if your vehicle told that red light to turn green, well that’s what we're talking about," he said. 500 cars have already been outfitted with the technology and the others will get the devices in the coming weeks. Roughly 70 cars are new models from eight different auto companies and are already embedded with communication devices. The yearlong pilot will offer researchers the opportunity to understand how effective visual and audio safety warnings are and how reliable various wireless technology devices are. Systems will be researched and their use refined, and at the end of the year, data on prevention and vehicle communications will be presented to the U.S. Department of Transportation. The DOT plans to work with researchers and industry leaders to see if a possible mandate requiring vehicle-to-vehicle communication is feasible, in terms of both technology and cost. and then we’ll see where it takes us," LaHood said Tuesday, later adding: "This technology has great promise. The promise really lies in will it save a lot of injuries? Will it save a lot of lives?" What is clear is the deployment affirms the significance of southeast Michigan in the continued development of the auto industry. It also puts a national spotlight on U-M and on Ann Arbor, which not only has thousands of volunteers participating in the study but is expecting to be a hub for vehicle and communication device manufacturers who are part of the study. Connected Vehicle warning devices can help drivers avoid serious lane change crashes, researchers say. "It makes great sense that the safety pilot is happening in Michigan, after all the automotive industry is part of our DNA. The industry was born and took root here," said Stephen Forrest, U-M vice president for research. Though U-M nabbed the federal contract to host the deployment, it competed with several schools in other regions for the project. The project's placement in Michigan was vital in affirming the continued presence of serious and cutting-edge auto development in the state. UMTRI director Peter Sweatman called "this region the center of the auto world." "This is the right place" for the project, he said. Added Forrest: "We are leading the way in many key areas of research that are literally reiniventing the automobile." Of the eight companies providing wireless infrastructure for the deployment, three —including Denso International of America, DGE Inc., and Auto Talks Ltd.— are either based in Michigan or have U.S. headquarters in Michigan. Additionally a handful of Detroit-area auto companies are providing 128 new vehicles with integrated wireless systems for the study. Wed, Aug 22, 2012 : 4:13 a.m.
What will these smart cars be used for if no one has a job that can pay for the gas or the clean power to run them? I am sure these cars serve some purpose....but it doesn't seem to be one that will benefit the out-of-work middle-class in Michigan. Sure am glad it wasn't the tax dollars from senior's pensions that made it possible. Thu, Aug 23, 2012 : 8:14 p.m. Wed, Aug 22, 2012 : 2:44 a.m.
Will it knock the cell phone out of the driver's hand? That is what is really needed. Wed, Aug 22, 2012 : 1:58 a.m. Wed, Aug 22, 2012 : 1:49 a.m.
What if a car gets stoned? Would it do 30 in a 45? Wed, Aug 22, 2012 : 1:31 a.m. In my experience, the more computer there is in a car, the more frequently it breaks down. And when it inevitably breaks down the necessary digital repairs are far more expensive. Finally there will come a point where the machine dies for good, and the only answer to get another. Compare this to the classic cars here and in Cuba that are still working generations later. Mandating these devices in cars is just the same old strategy of putting out a faulty product that will have to be constantly repaired and replaced. Except now they plan on forcing you into this cycle. If you want to revolutionize the car, make it fly already. Tue, Aug 21, 2012 : 11:49 p.m.
it's pretty cool that they're doing this in ann arbor. it'll be interesting to see (assuming no one gets hurt)... what happens... if anything... if 2 of these collide together. will they tweet to one another and say 'sorry', or 'ouch'? Tue, Aug 21, 2012 : 11:35 p.m. I drive a car that warns when other large vehicles are in the next lane. That warning does not always work. It also does not detect cyclists, or pedestrians. I can see how some drivers would quickly come to depend on that warning. I can just hear them &quot;but the warning didn't tell me the car was there!&quot; From that perspective, these aids can be dangerous. Similarly, the car has a backup camera. The camera is nice in some situations but I don't think it is a substitute for the use of mirrors. It won't really tell you if your side mirror is about to strike the side mirror of another car. Again, I can see how new drivers could become dependent on those aids and then blame them when they fail to prevent damage. Wed, Aug 22, 2012 : 2:03 a.m. Blind spot warning Ron? The system is suppose to detect when another vehicle is in your blind spot, so detecting a pedestrian or bicycle was never its intention. However, describe &quot;other large vehicles&quot;? Most of these systems also only work above a certain speed limit. And, if, as you say, how drivers could become dependent on these aids, why did you buy a car with one? Most are options. Yes, you could buy a car off the dealers lot with it already installed, but why pay for something you don't want? Wait a few weeks and order the car to your specs. It can really occur, despite what the salesman tells you. Tue, Aug 21, 2012 : 10:23 p.m.
Let's hope the smart cars actually improve on the stupid drivers around here. My guess is that they won't, and will make bad drivers even worse. Tue, Aug 21, 2012 : 10:12 p.m. I am sorry but I have yet to read how exactly this will save 32,000 lives. Can it take control to safely steer the car? Brake at high speed - after correctly processing the split-second mega-traffic situation? Show drivers what to do on a dashboard display instead of them watching the road? Tell drivers what to do and expect an obediant response during an emergency situation? The only practical use is for traffic crowd control and post accident reporting. Maybe vehicle/cellphone ID triangulation. And to collect lots, and lots of public data for government and industry use.. Wed, Aug 22, 2012 : 3:26 a.m. Sorry. I don't drink the koolaid and I prefer to wear a beret. I would prefer drive my own Tesla than be held hostage in a computerized gas hog. I also know a little about computers, neural networks,government, and aircraft. Autopilot takes samples of the aircraft environment from dedicated onboard sensors. It integrates that data with continuous guidance from broadcast navigation signals to select a pre-programmed flight.routine. It would not know what to do if an asteroid or hurricane suddenly appeared. Ask any good pilot who they would want flying during an emergency. Yellow Cab would be happy to provide you with a chauffered limo at anytime. Wed, Aug 22, 2012 : 2:49 a.m.
Take off your tinfoil hat. This is a step toward vehicles that can react before a driver can. I know you would like to believe that human operators can outperform autopilot, but in modern aircraft that is simply not true. Ground vehicles are next, and wireless communications is a step in that direction. I would love it if I could be chauffeured about in an autonomous vehicle so that I could read the paper (or sleep) while travelling to my destination. Tue, Aug 21, 2012 : 9:35 p.m. So does this mean the smart meter proponents will now be complaining of all the new road wireless transmissions causing them health problems? Tue, Aug 21, 2012 : 9:21 p.m. This town doesn't need smart-cars, it needs smarter drivers. Smarter cyclists, too. Tue, Aug 21, 2012 : 8:31 p.m.
Thu, Aug 23, 2012 : 8:09 p.m.
Tue, Aug 21, 2012 : 8:29 p.m.
No complaints yet from group who thinks smart meters are bad...hmm...not complaining about a technology that can &quot;better&quot; their lives now, eh? Tue, Aug 21, 2012 : 8:18 p.m.
Just like the old movie - Dumb &amp; Dumber! Tue, Aug 21, 2012 : 7:58 p.m. I'm ready to see 32,000 Americans not killed on the road each year. And if we can develop this technology how many jobs will be created to export it? Tue, Aug 21, 2012 : 7:46 p.m. This is great. Big brother will not only know where I'm at but how and when I got there. Electrical smart meters and now devices for cars. What a waste of money that can be used for useful things. Wed, Aug 22, 2012 : 1:01 a.m.
Tue, Aug 21, 2012 : 7:36 p.m. I am one of the individuals that received one of the new cars for the study and I am very excited to participate. Tue, Aug 21, 2012 : 7:15 p.m. I'm one of the 500 with the device in my vehicle - should be interesting to hear what the results are. Tue, Aug 21, 2012 : 7:14 p.m.
Lovely. As a society the family unit can't meet around the dinner table &amp; talk to each other but now our cars can? This sounds like a script for The Truman Show 2. Tue, Aug 21, 2012 : 6:12 p.m.
Any story containing the word &quot;smart&quot; and the name &quot;Ray LaHood&quot; is just not credible. Tue, Aug 21, 2012 : 6:08 p.m. Finally, a mobile neural network capable of managing all of those pesky people units - no more need for their car-curbing government, either! While great to keep UM scientests employed - until we all ride hostage in driverless google cars, this tech is at best Machiavellian and at worst will add more driver distraction - to what benefit? Tue, Aug 21, 2012 : 5:19 p.m. I can hear it now…….. Car 1 - Hey – where're you going? Car 2 – To the strip joint. Where are you going? Car 1 – To church. Hope the wife of your owner does not catch him. If so, he is dead meat. Cover your tracks - man!!! The whole time, Big Brother is watching. Oh – so is the owners wife of Car 2, because she has his logon password and can see everywhere he goes. Wed, Aug 22, 2012 : 2:34 a.m. Wed, Aug 22, 2012 : 1:45 a.m.
Tue, Aug 21, 2012 : 5:06 p.m. Finally a step in the right direction. The faster we can move away from 19th-century rail &quot;technology&quot; and towards 21st-century vehicular automation, the better off we'll all be. Tue, Aug 21, 2012 : 10:09 p.m.
Tue, Aug 21, 2012 : 9:56 p.m.
@Bhatavdekar- I can tell you that we (the United States) have all of the technology necessary to build a high-speed rail line. The United States, having the highest-utilized rail system in the world (you can look that up), long ago developed most of the technologies that are currently being used by other countries. Rather, my suggestion is that we look to our existing infrastructure (long, nicely-arranged freeways), our existing &quot;rolling stock&quot; (in the form of hundreds of millions of automobiles), and our ingenuity (as suggested by this article) to further explore the possibilities available to us in automating cars for high-speed, long-distance travel. Is that not innovating Mr. Bhatavdekar? Or must we lash ourselves to the &quot;rail&quot; paradigm? Tue, Aug 21, 2012 : 9:41 p.m.
Tue, Aug 21, 2012 : 5:55 p.m.
Just because it's old, doesn't mean rail technology can't be incredibly helpful. To take an extreme example, imagine if all rail to/from/under Manhattan were to stop functioning. It would be a disaster. Tue, Aug 21, 2012 : 4:20 p.m.
Tue, Aug 21, 2012 : 9:45 p.m.